Every ticket for this show includes a CD copy of Mark Knopfler’s Down The Road Wherever. You will receive an email with more details about this offer approximately 7 days after your purchase. US/Canadian residents only. Offer not valid on Resale tickets. 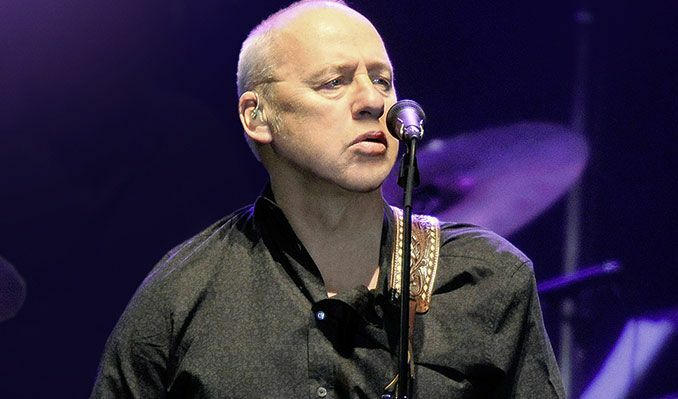 Mark Knopfler was born in Glasgow, Scotland, on the 12th of August 1949. He was around seven years old when the Knopfler family moved to Newcastle-Upon-Tyne in the North-East of England. Mark attended Gosforth Grammar School. As a young boy Mark was inspired by his uncle Kingsley's harmonica and boogie-woogie piano playing. Later, in his teens, he set his heart on an all too expensive flamingo-pink Fender Strat, just like Hank Marvin's, but in the end he had to settle for a $50 twin pick-up Hofner Super Solid. $50 was a lot of money in those days. Like lots of other guitar-toting schoolboys of the 1960s, Mark served an early apprenticeship by forming and joining anonymous schoolboy bands and listening to guitarists such as Scotty Moore, Jimi Hendrix, Django Reinhardt and James Burton. At sixteen he made a local TV appearance as half of a harmony duo along with school-friend Sue Hercombe. In 1996 Mark began his career as a solo performer with the release of the Golden Heart album. The album was simply a step forward in the evolution of his music, "It's just moving forwards...", he said, "... just trying to be better." Mark's solo career has allowed him to hone his rare talent as a singer/song-writer. His second solo album, Sailing To Philadelphia, was released in 2000. Autumn 2002 saw the release of his third solo album, The Ragpicker's Dream, but, just as rehearsals were about to begin, the planned 2003 tour had to be cancelled due to a serious motorcycle accident. Thankfully, Mark made a full recovery from his injuries and was on the road again in 2005 to promote his fourth solo album, Shangri-La, released in September 2004. One year on saw the release of The Best of Dire Straits and Mark Knopfler: Private Investigations compilation album. 2006 saw the release of a number of albums to which Mark has contributed, and also of the much acclaimed and Grammy nominated All The Roadrunning CD with Emmylou Harris, promoted by a tour of Europe and North America. In the fall of 2007 Mark will be releasing a new solo album, Kill To Get Crimson. There remains another side to Mark Knopfler, a very private side. By the mid-80s Mark was being referred to by some as the "quiet man of rock and roll." He is shy by nature and gets embarrassed when fans tell him how much they have been affected by his songs and how his music has changed their lives. It is a matter of public record that Mark has been married three times. His second marriage produced his twin sons, Benji and Joseph, born in 1987, and his third marriage to Kitty Aldridge has been blessed with two daughters - Isabella, born in 1998, and Katya born in 2003. After almost thirty years at the top of his profession, Mark Knopfler remains, at heart, a family man who loves nothing better than to spend time with his wife and his children.